New book, 408 pages. 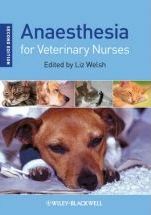 Anaesthesia for Veterinary Nurses has been written specifically for veterinary nurses by veterinary nurses and veterinary surgeons. Easy to read and understand, it provides detailed coverage of the physiological, pharmacological and physical aspects of anaesthesia. Fully updated and reflecting recent changes to veterinary nursing qualifications, this second edition is now also illustrated in colour. Sedation and anaesthesia are a crucial part of veterinary practice, and the protocols and methods involved are often complex and vary considerably from animal to animal. In addition to cats and dogs, Anaesthesia for Veterinary Nurses contains detailed sections on rabbits, rodents, birds, reptiles, and larger animals. Suitable for those with or without previous subject knowledge, this book is ideal for quick reference by veterinary nurses and technicians in practice, or for more substantial study by students. Reflects recent changes to veterinary nursing qualifications, current terminology and drugs in use. Includes chapters on small mammals, birds, reptiles, and large animals. Now illustrated with colour photographs.